Longreads is on a mission to publish high quality long-form writing. They are funded by Automattic, the company behind WordPress, which powers a huge percentage of the internet. After we originally featured Longreads in our weekly newsletter, the editor of the publication, after getting a deluge of submissions, responded by writing a guide to pitching. She leads her guide with the argument that the personal is alive and well, as proven by the very large volume of submissions she has received.. That is something that I can attest to as well –– it is clear that many of the readers of Freedom With Writing want to publish personal essays. 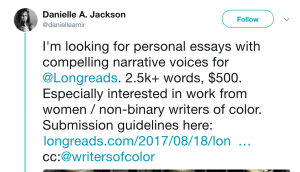 If you’re in that category, there are indeed many publishers out there that publish personal essays, though it is often quite competitive to gain publication. Longreads is a great example. I highly recommend reading the editor’s guide to pitching before submitting. In the guide, she notes that they’ve increased the number of essays published to nearly 12 a month.